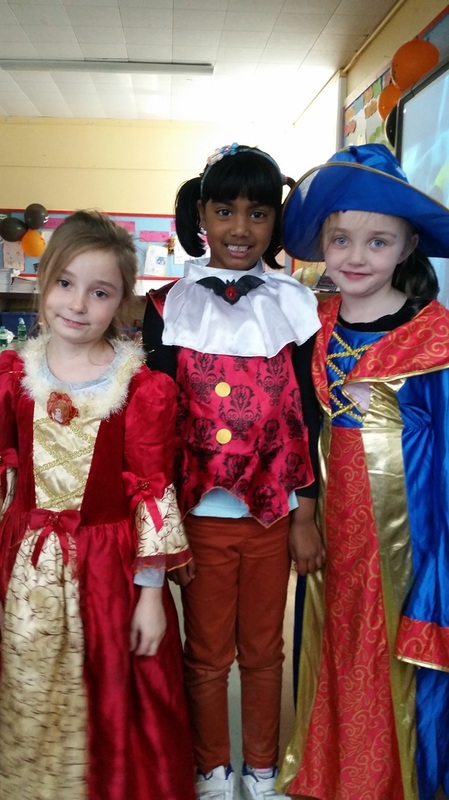 Everyone looked great wearing their green, white and orange outfits for Saint Patrick's Day. 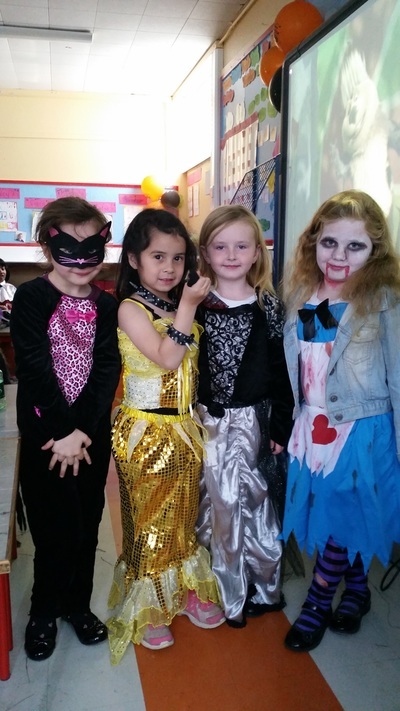 We had great fun learning a dance with the girls in 3rd Class, singing songs and watching the Infant Parade. 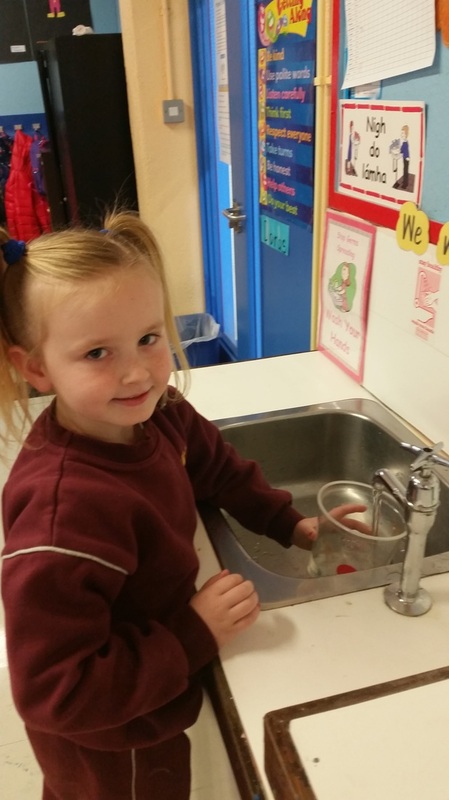 The girls in First class all looked lovely in their red and pink outfits for Saint Valentine's Day. 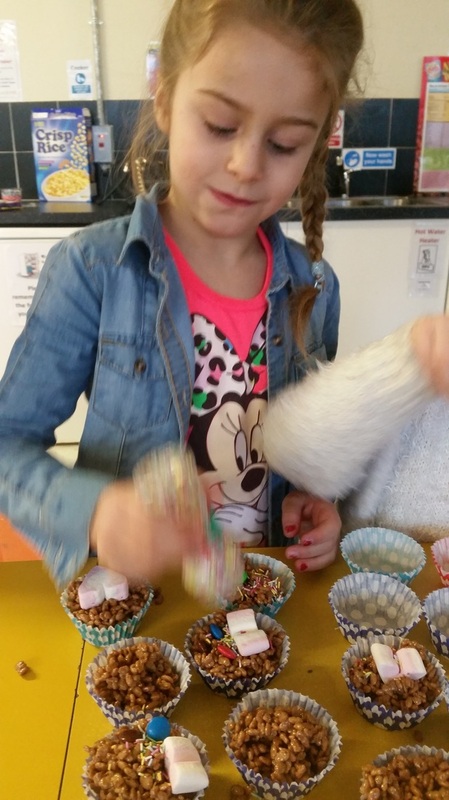 We had a lovely day and enjoyed making treats for the special day. 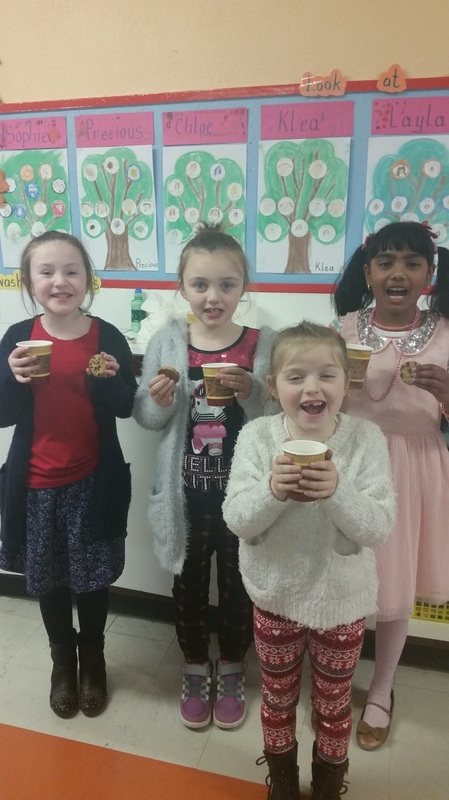 We all loved our delicious pancakes today in school. Thank you to Miss Mc Dermott for making them for us. 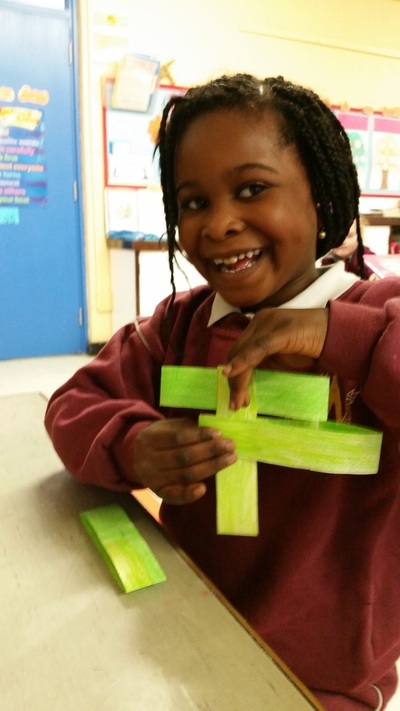 We really enjoyed listening to the story of Saint Brigid. Saint Brigid's Day is on the 1st of February. 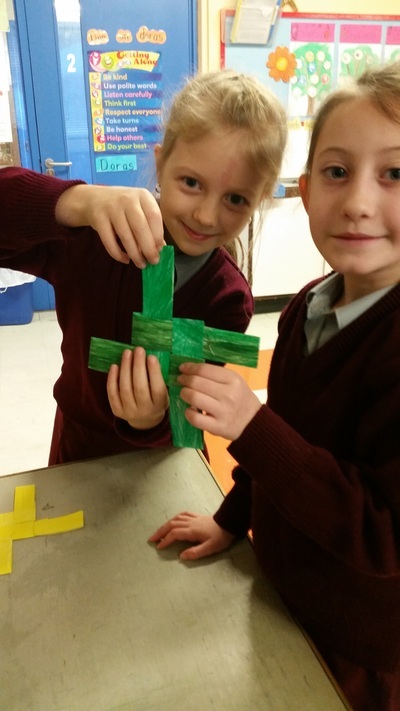 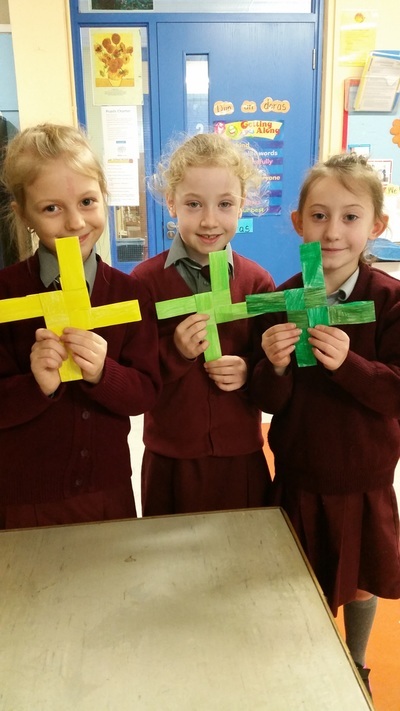 We made lovely crosses using paper in class. 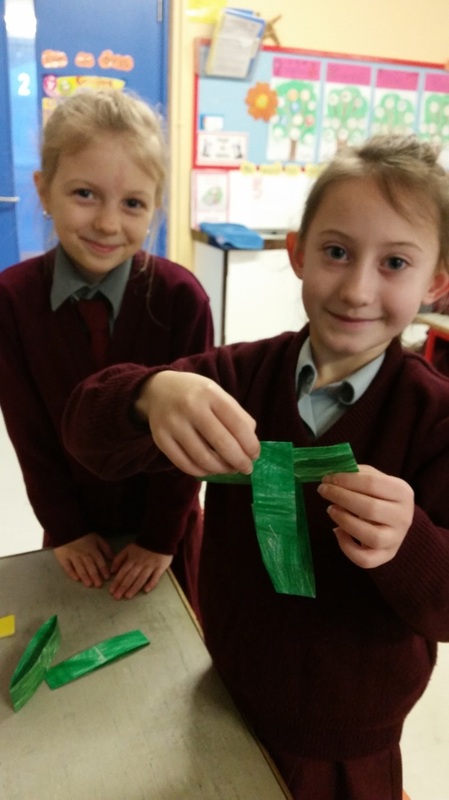 It was great fun making them. 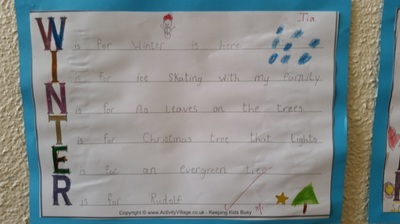 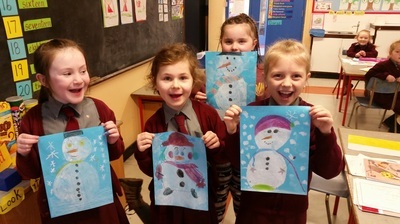 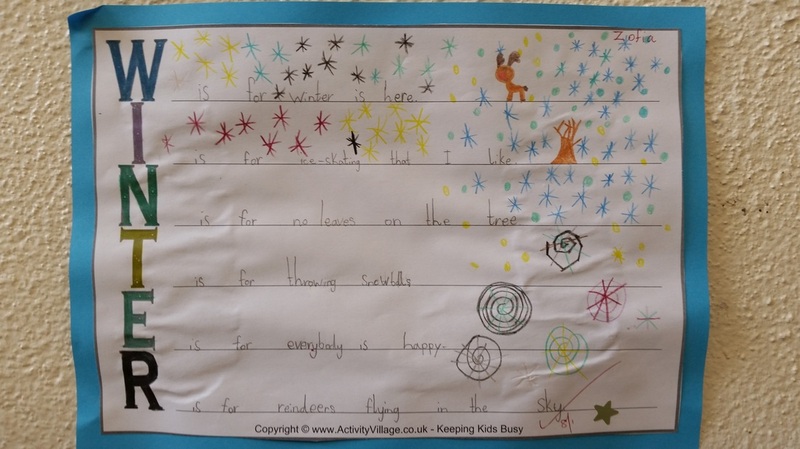 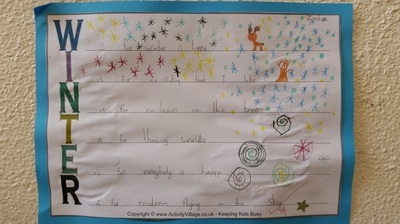 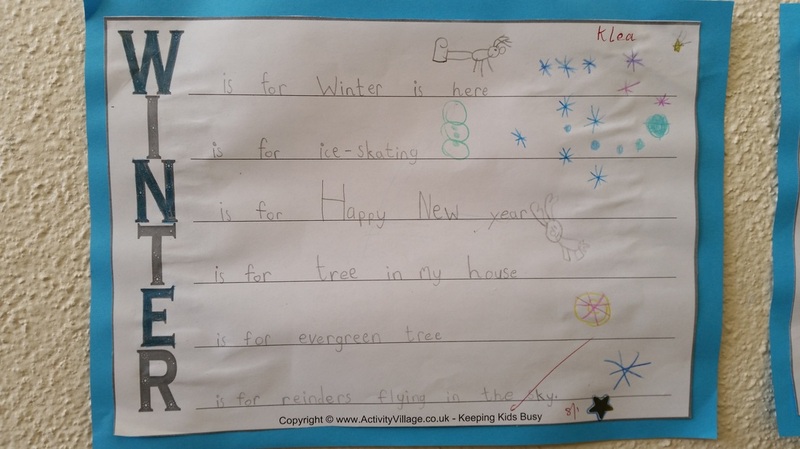 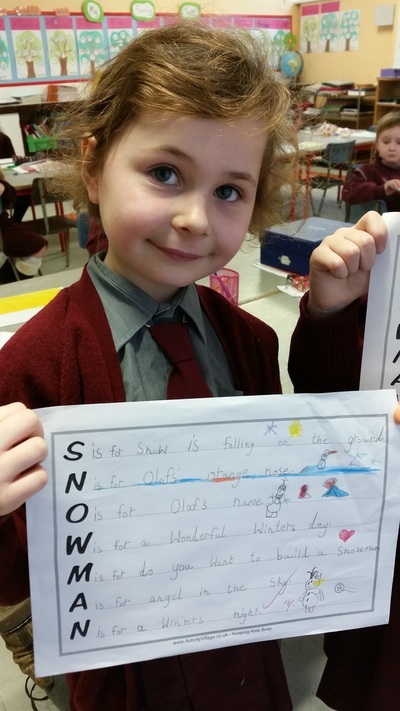 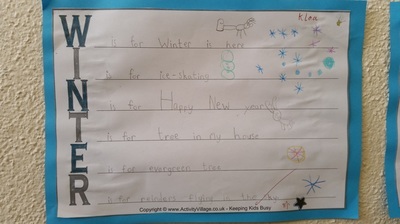 We have been learning lots of information about winter. Take a look at some of our chalk drawings of a snowman and also, read some of our excellent acrostic poems. 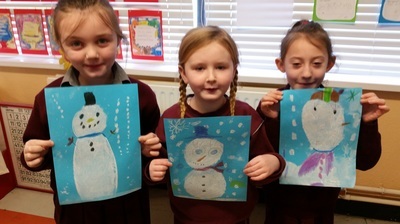 The girls in First Class love listening to stories. 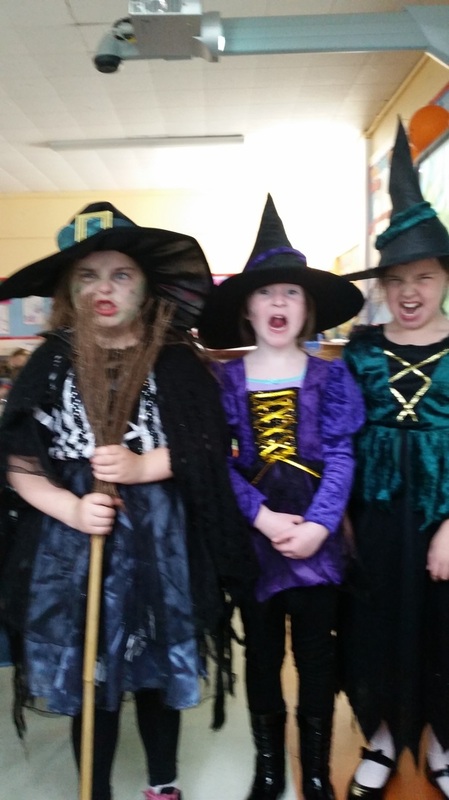 We have been reading books about Winnie the Witch in class. 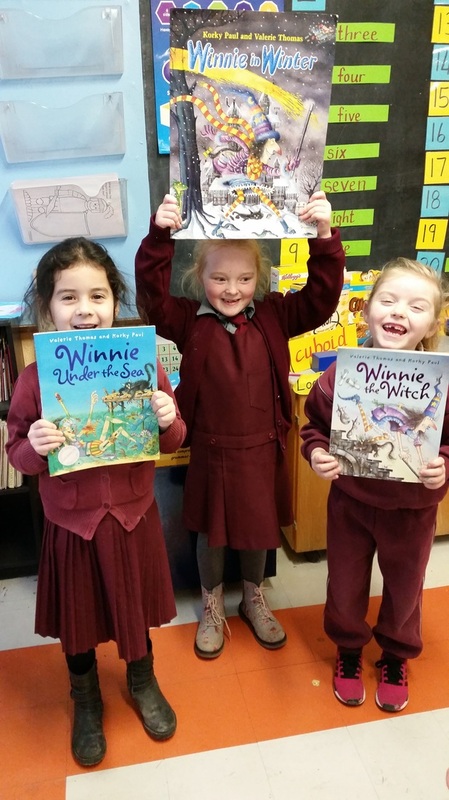 They have really enjoyed listening to the stories and finding out what Winnie and Wilbur get up to in each story. 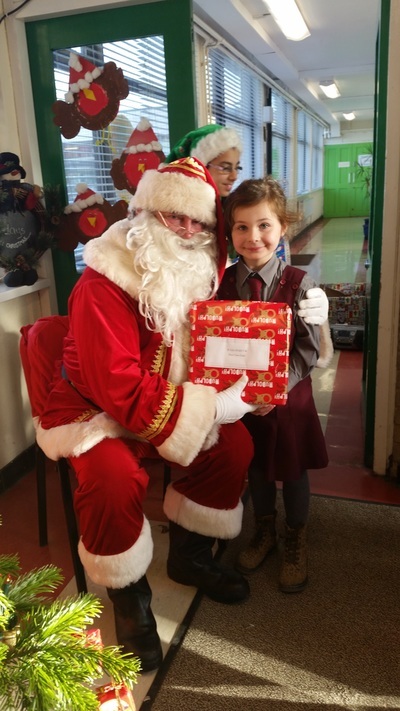 Jia was very kind to bring in a book from home called Winnie's Big Bad Robot. 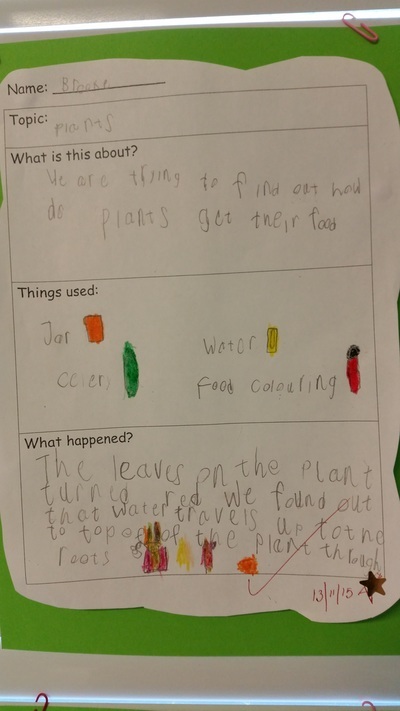 It was a fantastic story. 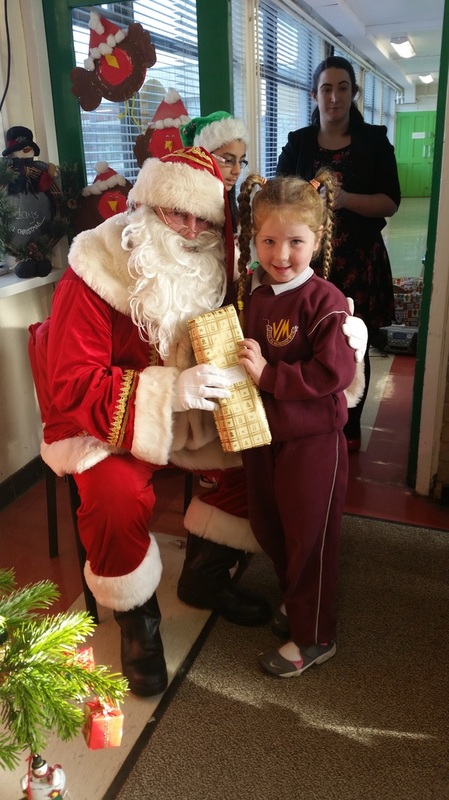 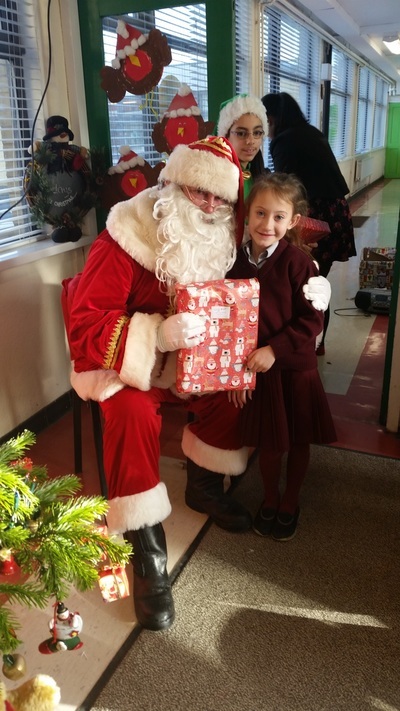 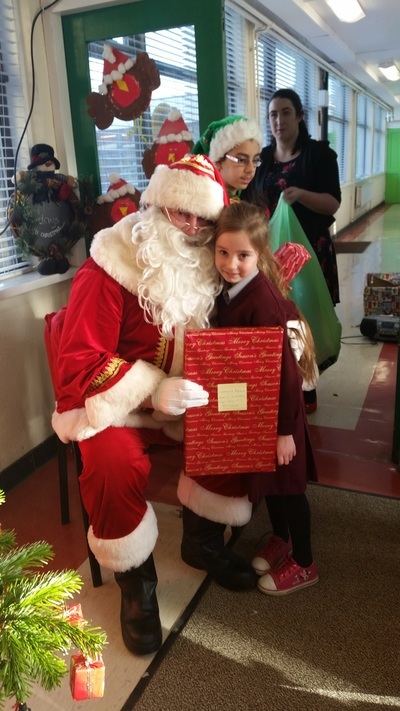 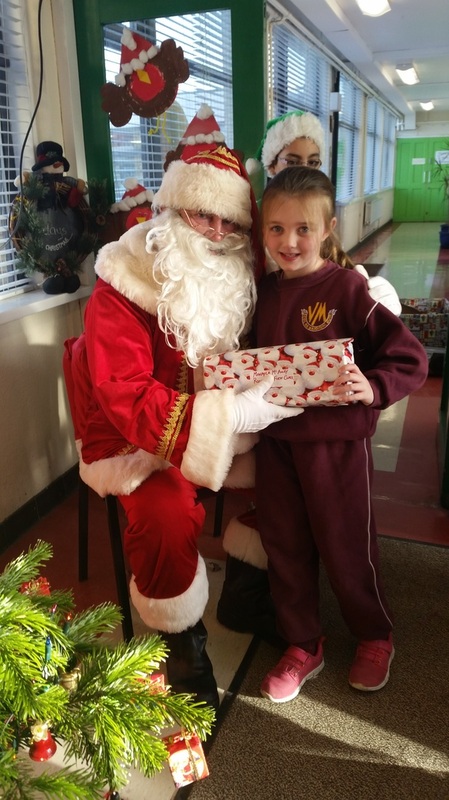 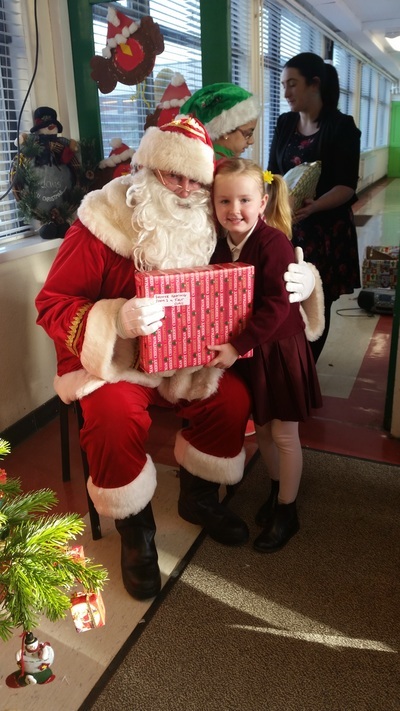 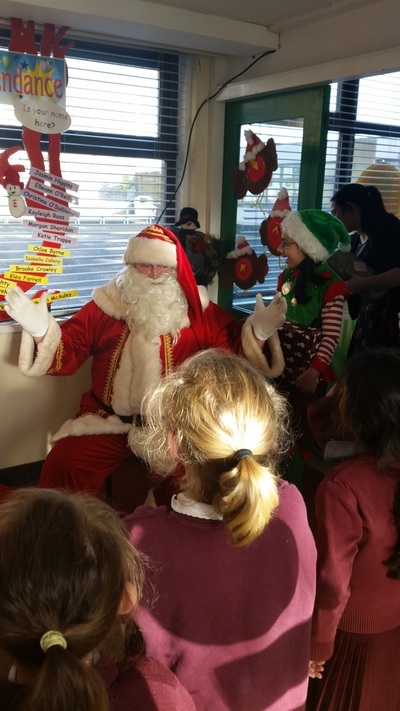 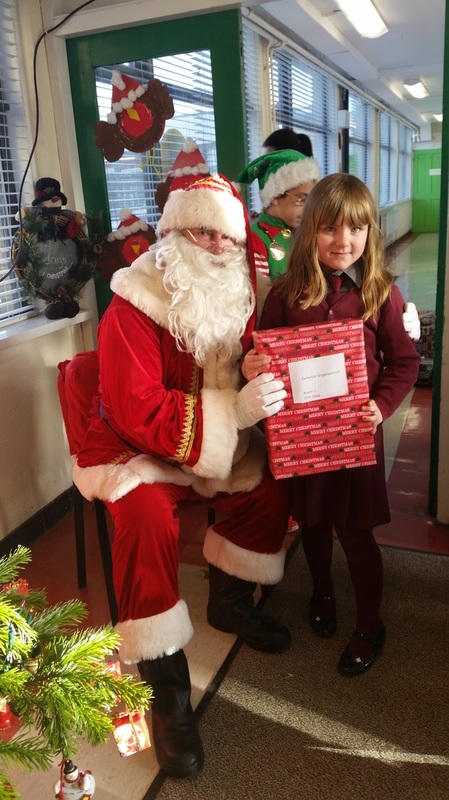 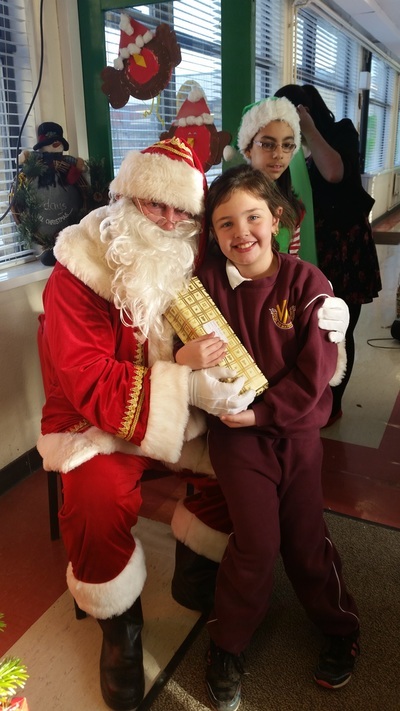 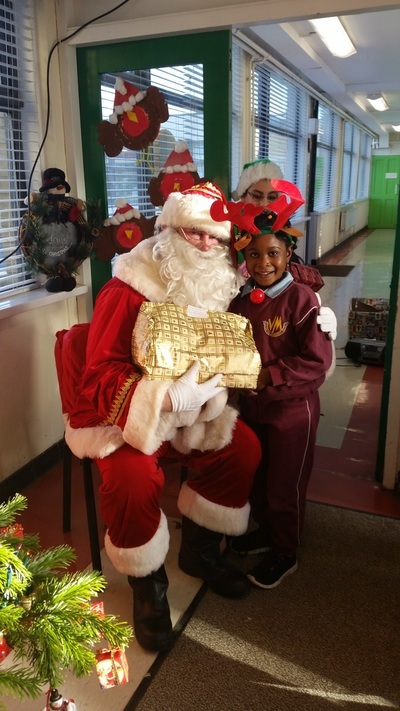 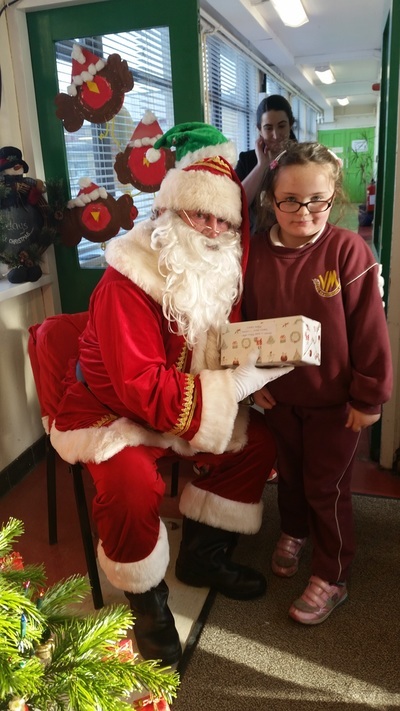 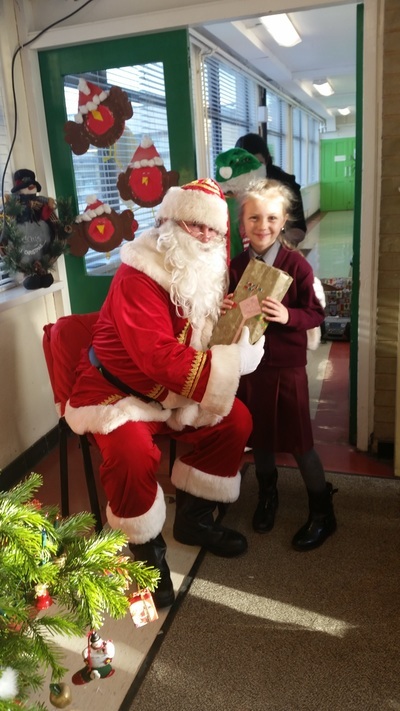 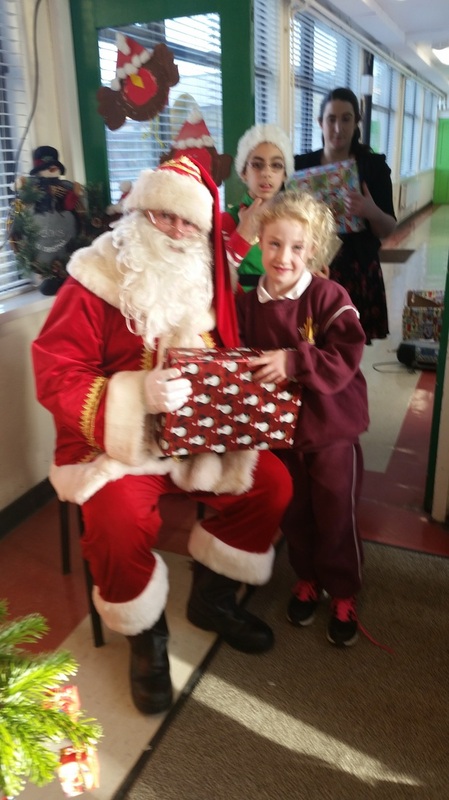 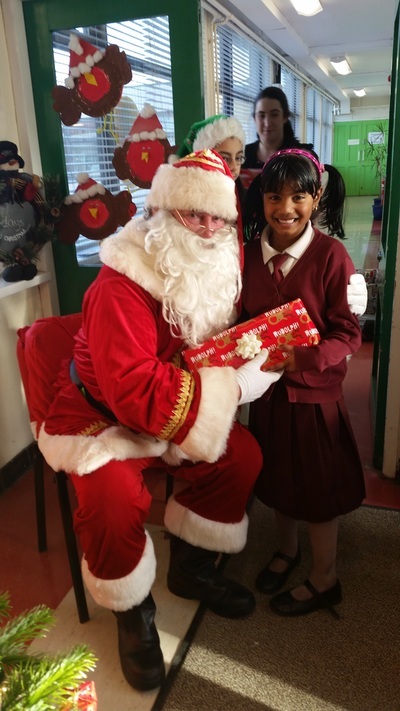 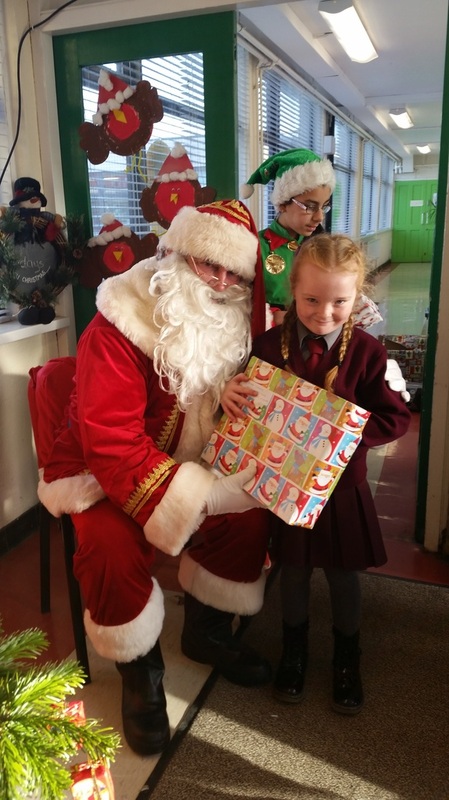 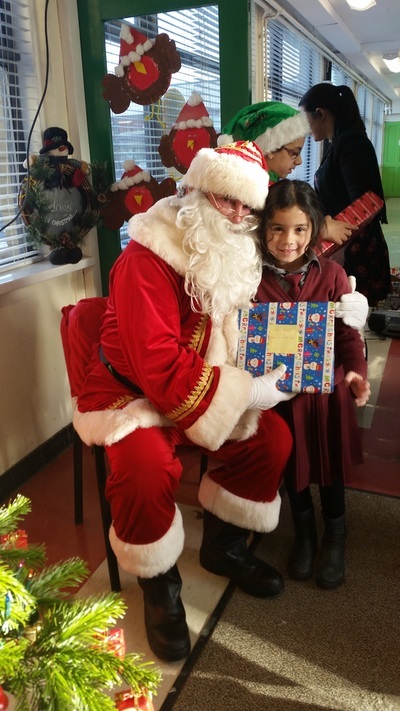 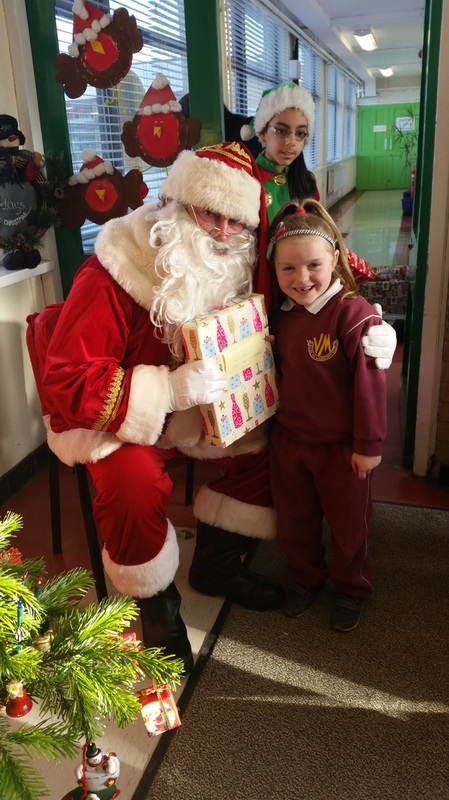 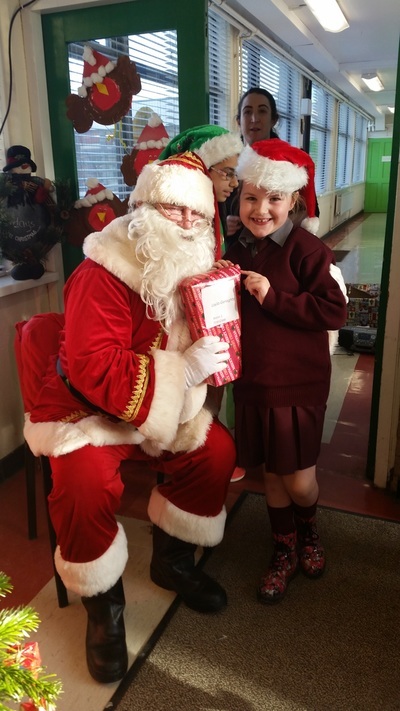 There was great excitement on the 21st of December when Santa visited the girls in the Virgin Mary School. 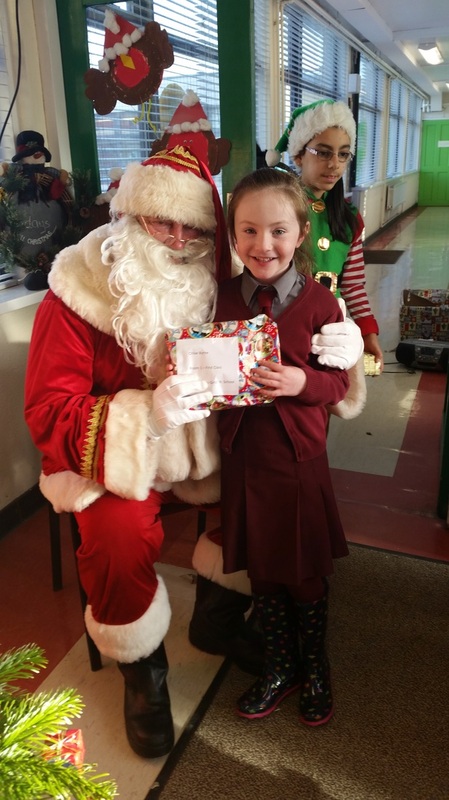 Santa said everyone is on the nice list and he gave each girl a lovely gift for Christmas. 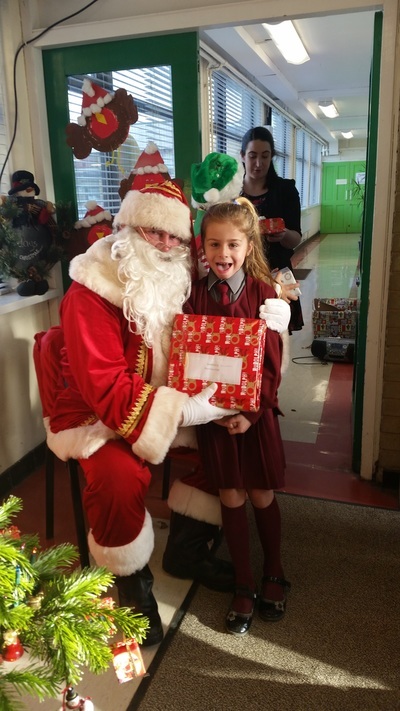 The girls were delighted with their presents from Santa. 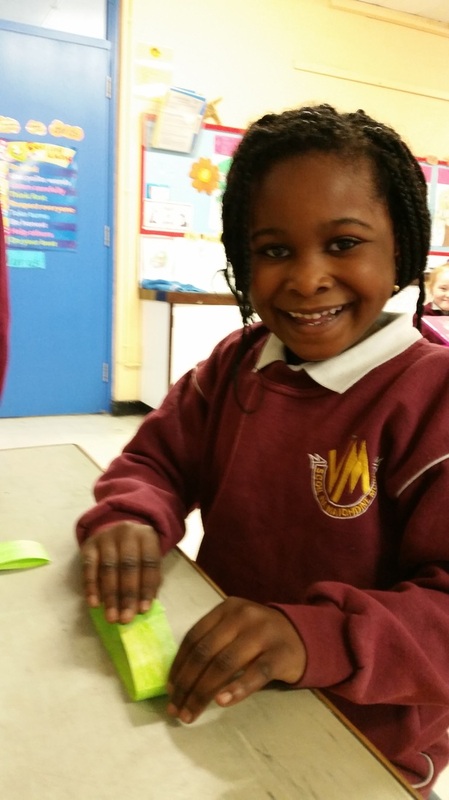 They had great fun playing with their new toys in class. 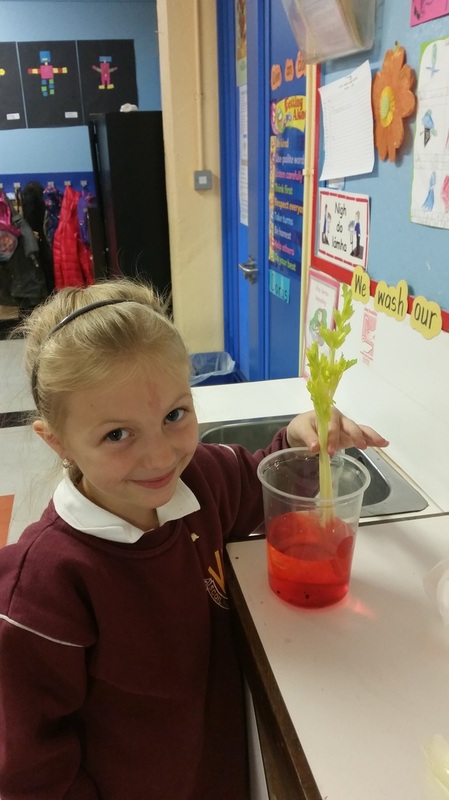 Science Week took place from the 8th to the 15th of November. 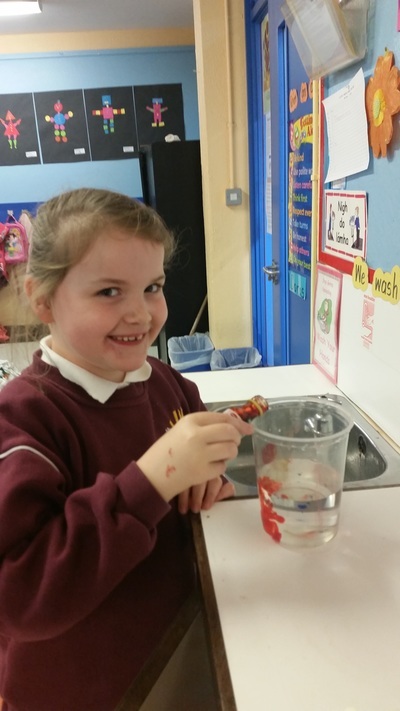 We really enjoyed Science Week in our school. We did an experiment to find out how plants take in water. 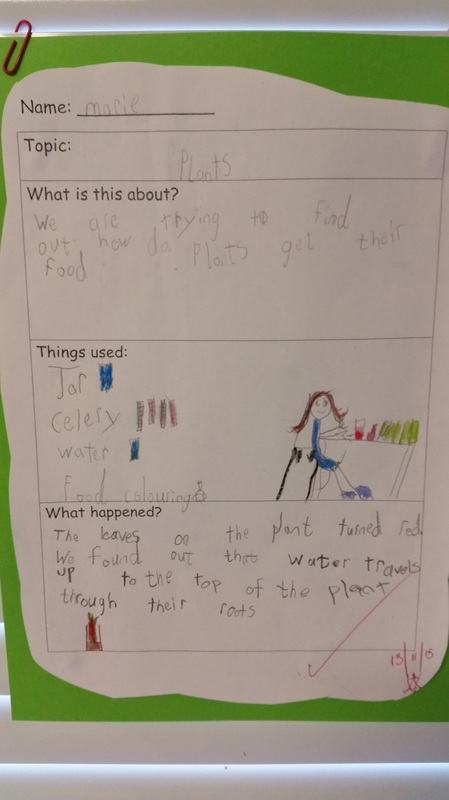 Look at our photos and you will see what happened. 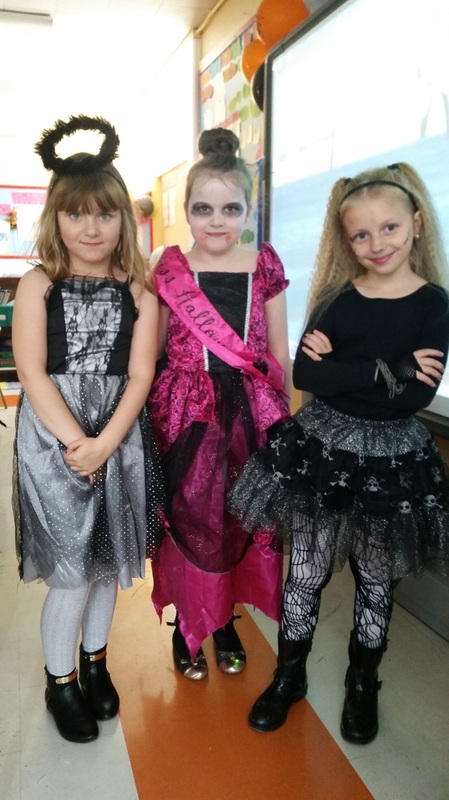 The girls in First Class had a great time when they all dressed up for Halloween. Everybody looked amazing in their costumes. 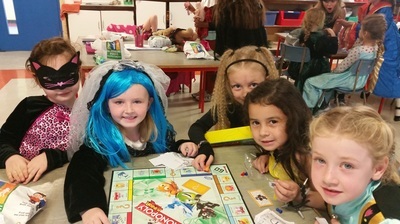 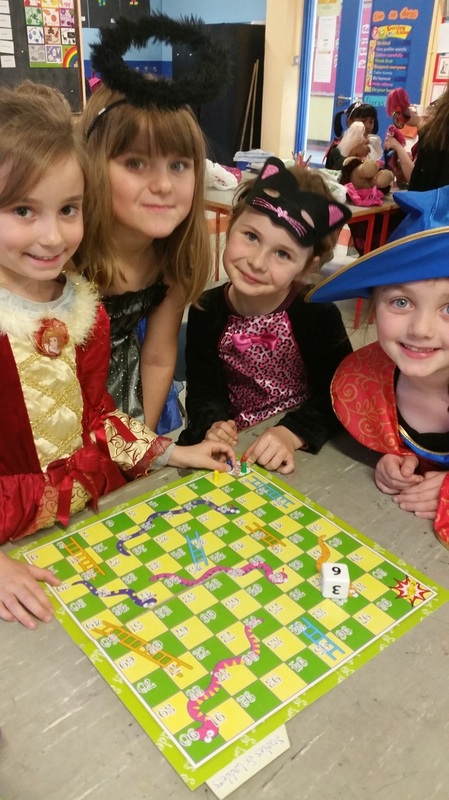 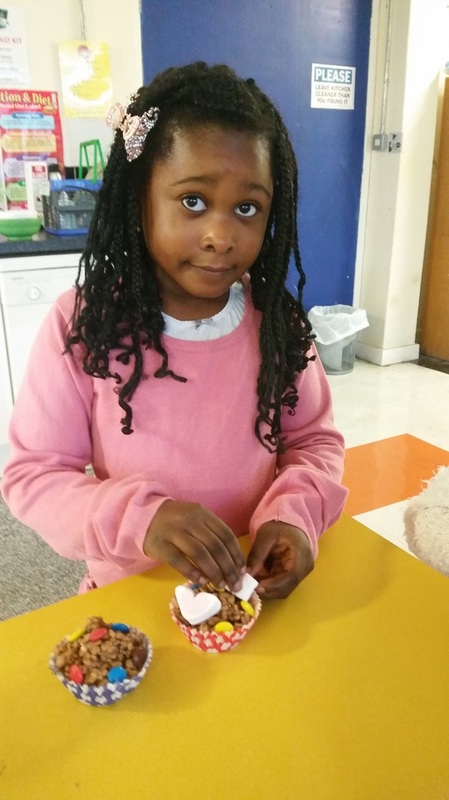 They really enjoyed getting time to play board games, sing and dance on the day. 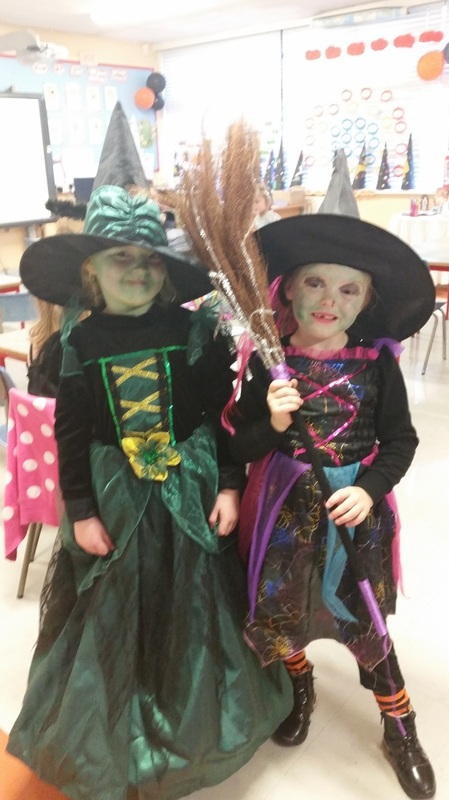 Happy Halloween to all!